Tai Lam Chung Reservoir was built between 1952 and 1957 in Tai Lam Country Park. To strengthen the structure, the reservoir is designated as the afforested area, and Maclehose Trail Stage 10 passes the north side of the reservoir. Therefore, it is not only a cool place to visit in summer, but also a very popular scenic spot to see maple in later autumn. Before the reservoir was filled up, there were many hills inside. 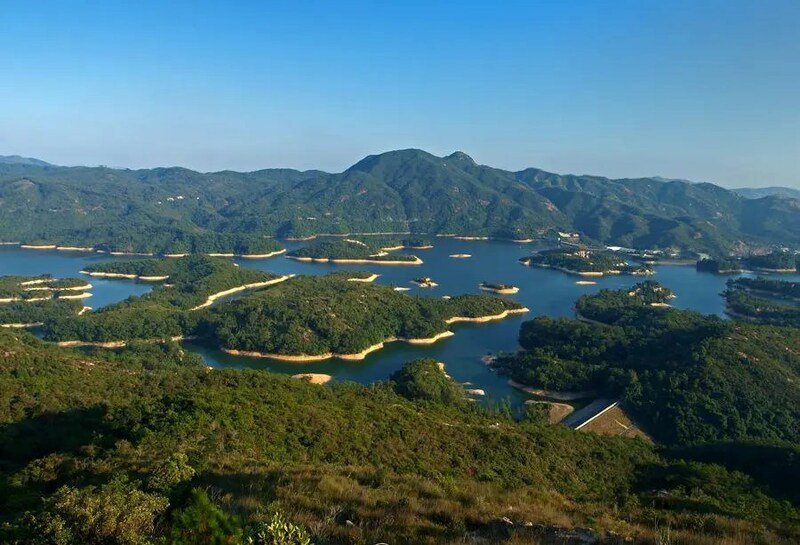 Nowadays, those hills have become dozens of small islands in the reservoir, which makes it look like the Thousand Island Lake (Qiandao Lake) in Zhejiang Province in China. You can follow Maclehose Trail Stage 10 to visit Tai Lam Chung Reservoir. If you want to take a picture of the “thousand islands” view, you need to climb uphill when you are near the reservoir. If you follow Maclehose Trail Stage 10, you can see the view when you are passing the reservoir. What Juliet says, is how to go there when there is no direction within the picture. Is it possible to walk between the little islands? Hi Tony, nope. Cannot walk between the islands. Hi, yes, there are lots of BBQ areas in the country parks. There must be a few around the reservoir. Is the path uphill really a path that one can walk on? or is it more like climbing along the hillside. Another website showed the direction but the path looks like one would have to be on all 4 going up. Hi Jane, the top of the hill is around 300m. You do not need to reach the top in order to view the whole reservior. Do you think there’s any way to go paddling inside the reservoir? For this reservoir, no 🙂 But you can try Tai Mei Tuk Water Sports Centre and Chong Hing Water Sports Centre.